The success in e-commerce business looks like to be eating up the retail world right now. In the digital marketplace, the digital world is an exciting place to be, with business owners starting their very own digital brands and competing. Although online businesses have been forced into creating an online presence, it isn’t always easy to hit it big online. If you want to make it to the top then you have to know what some of the trade secrets. So, the industries will face different hardships as there are many common reasons for the e-commerce struggle. However, as there are some general battles, all e-commerce businesses have to fight. These problems may have simpler solutions than you’re thinking about. On their own merits, people aren’t judging your business initiatives or products. So, they may have a higher expectation than that you offer them. You’ll deter customers who want their products quickly if you have too many shipping options on your site. Although you may read about much success in e-commerce businesses in Bangladesh, there are some general battles that all e-commerce businesses have to fight. And not less than 80% of the newly started -commerce businesses fail. By a thorough research, we have found three main reasons that are responsible for these huge failures. As there are problems, there are solutions as well. But, there is certainly no better time than now if you’re looking to get into e-commerce. We are going to see more amazing things with a public that has been getting more and more familiar with the use of e-commerce. 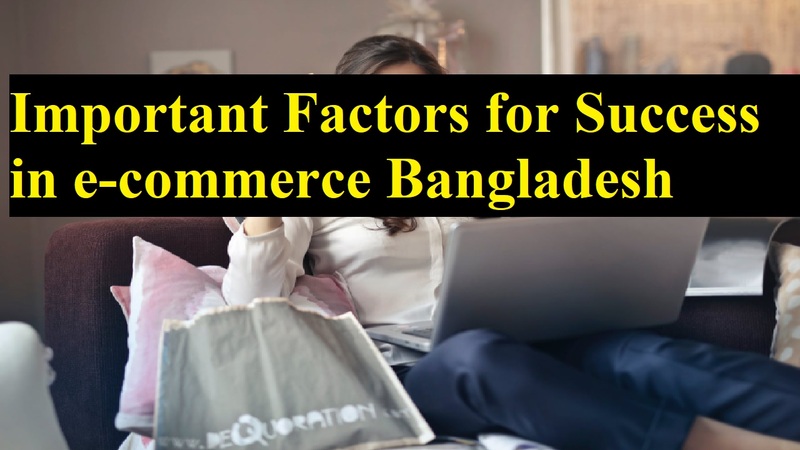 Well, let’s know the factors to get success in e-commerce business in Bangladesh. Comparing prices between brands is natural for customers. So, as an entrepreneur, you must be aware of how much competitors are charging for their goods. In this case, you can use some different tools if you want to know and compare the prices of competing for e-commerce websites. Depending on the market and the kind of products being priced, various pricing strategies are employed. For example, it’s basically the doubling of wholesale price, which is one of the most common pricing strategies is keystone pricing. Although that usually works, consider additional factors so the price is just right, not too high or too low. Apart from these, there are also different prices. These include discount pricing, psychological pricing, competitive pricing, value-based pricing, and so on. When compared to products from physical stores, people had the notion that products from e-commerce sites were of inferior quality. There is still a lot that must be done to convince customers that your products are comparable in quality to those found in malls and another store while much of that myth no longer exists these days. That’s why you must ensure that your products are not only from well-known but trusted suppliers of high-quality goods as well. It will definitely be a blow to your business if you ever ship a subpar product to a customer. But, as bad product quality can break your business down, overall customer satisfaction is crucial to the business’ continued survival. It must accommodate all types of customers while designing your e-commerce website. This is because the online store is your main tool for communicating and transacting with them. That’s why you have no other options to make it able to relay information fast and concisely to evoke the trustworthiness of your business to your customers. As it helps your business is within reach to all sorts of customers, accessibility is of utmost importance. They’re a significant part of your audience while being able to have your online store set to other languages. And when you improve your website’s accessibility, people can potentially view your site. If users like a website or not by just a glance then they know that the first impression usually lasts. So, you can get more customers to your online store when you have a good first impression for your site. In order to entice people into coming in and making use of your e-commerce website, make the best and eye-catching design. As it will help you convince people to take a look at what you have, good web design has principles you can follow. Avoid making it either too loud or too barren. Although everything in it should be easy to understand, you should maintain its own personality. Besides, you need to optimize UX if you want to funnel traffic toward a desired action. Because when site visitors get confused, they’ll leave. That’s why it must be easy to navigate your site. Also, you have to make it clear what your business does on your website. What your brand does on your site should be emphasized. And your call to action needs to be clear and concise. Also, ensure that your shopping cart is not only easy to view but easy to access as well. As nobody wants to deal with a checkout process that makes purchasing your product harder than it needs to be, the checkout process must be straightforward. The issue of security is one of the main concerns with e-commerce for both entrepreneurs and consumers. There is always the potential for e-commerce websites being compromised and customer data stolen for nefarious purposes with personal and financial information being handled online. As it gets entered in online every single day, it’s especially true for credit card information. If you want to secure your customers’ online shopping experience then you must use SSL. As there is less of a chance for them to be compromised, SSL ensures that transactions and data are encrypted. Adding other verification methods should help with two-factor authentication.